Property 2: La Gavaudiere is situated in its own 19 acres of land surrounded by woodland . 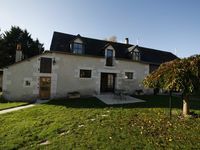 Property 25: Beautiful Loire Villa, south Loire Valley, private heated pool. Dogs accepted. Property 33: Charming countryside cottage on the edge of the water.